He was born on August the 30th in 1960, in Nakhchivan. He finished school number 1 named after U. Hadjibeyov in Nakhchivan 1977. After finishing school, he started working as a worker in a wine factory between the years of 1977-79. He was on military service in the Armed Forces of the USSR between 1979-1981.Aliyev also served for a short time in the Republic of Ukraine and completed his military service in Poland. In 1981-82, he worked in the Glass factory in Nakhchivan, and then in the Vaykhir Water-Construction Company between the years of 1982-92. His job on the Production did not stop him to continue his education. In 1987 he graduated from the philology faculty of the Nakhchivan State Pedagogical Institute. The Ministry of National Security Of Azerbaijan called him to serve in Frontier Troops in 1992. He held a number of senior positions and always adequately coped with the tasks. For the excellent service, Lieutenant Amiraslan Aliyev was appointed as the chief officer of the Headquarters. While serving in this post, he succeeded to establish order in the border region, and also managed to do very important job in the field of protection of the state borders. Amiraslan was awarded with the Honorary Diploma by the Military Unit for timely and accurate performance of the tasks, and high combat training achievements on the 8th of October in 1994. When a group of criminals were attempting to over throw the Government in 1995, Lieutenant A. Aliyev was assigned for an important mission. And on 17th of March 1995while on the mission, Amiraslan gave his life to protect the country. He was married and had three children. 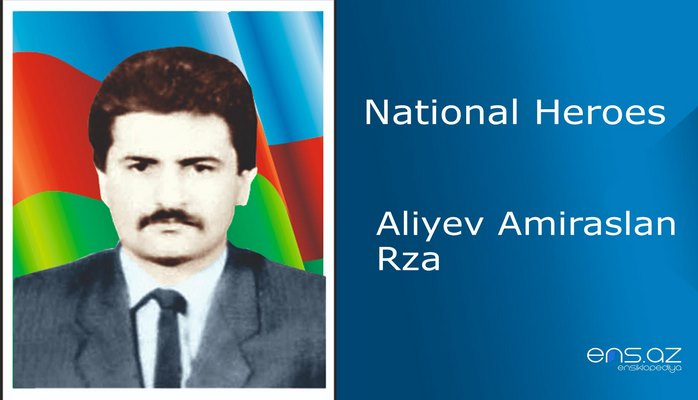 After his death the was declared a "National Hero of Azerbaijan" by the decree of the president of the Republic of Azerbaijan no 307 on the 4th of April, 1995. He was buried in the alley of Martyrs in Nakhchivan. “N” border station was named after A. Aliyev and there is also a “Memorial room” and a bust of him in “N” Border Post.